The views take center stage at this oceanfront eatery. 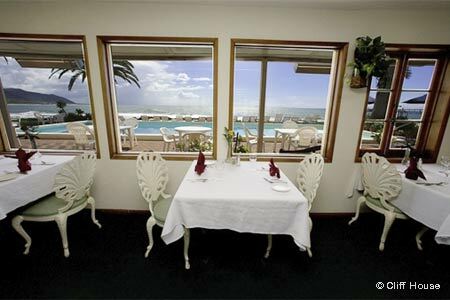 : At high tide, pounding waves can mist the oceanfront patio as diners watch dolphins leaping past. Palm trees sprout from a man-made island just offshore, creating tropical silhouettes at dusk. It is without question one of the most idyllic settings for a meal anywhere on the California coast. Yes, everyone likes the view, and though that is the main reason to come here, the food has progressed over time. Burgers and lunch salads are typical, but the seared ahi and fresh steamed mussels or pan-seared scallops with lobster nage risotto mesh well with the poetic locale. Desserts are all made in-house, including crème brûlée, which is the best offering. A limited wine list of mainly local wines doesn't impress, but the views will still inspire you.